Live at the Triad Studios, Eugene, OR, June 3, 1991. 1966 was the year the music industry noticed Mickey Newbury. Don Gibson had a Top Ten Country hit with Newbury's Funny Familiar Forgotten Feelings, while Tom Jones scored a world hit with the same song. In 1968, Mickey saw huge success; three number one songs and one number five - across four different charts; Just Dropped In (To See What Condition My Condition Was In) on the Pop/Rock chart by the First Edition, Sweet Memories on Easy Listening by Andy Williams, Time Is A Thief on the R&B chart by Solomon Burke, and Here Comes The Rain Baby on the Country chart by Eddy Arnold. This feat has not been repeated. That year, Newbury's first album, Harlequin Melodies, was released by RCA. In 1991, Newbury recorded some demo tracks at Triad Studios in Eugene, Oregon. "I'm pretty excited to put this out there. I think it's essential in this talented songwriter's legacy. In the short time I knew him, I got the impression that he'd understand this being unearthed. 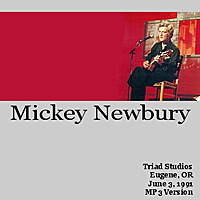 "In late spring of 1991, shortly after we arrived in town, it was set up that Mickey Newbury would come in for a day of recording as a gift to the previous owner of the studio we had just bought. I'll admit I was somewhat green to who he was, what he'd done in his career. We even recorded Just Dropped In (To See What Condition My Condition Was In) that day and I had no idea it was his song until a few years later. It was featured prominently in the film, The Big Lebowski, some years back. "I hung out with him quite a bit that day during the eight or nine-hour session, setting up the recording and the mics, during his smoking breaks, coffee binges, etc. He was a crusty old guy at the time and had been haggard by the years of living the musician's life. But we got along fairly well and he seemed very interested in what I thought of his music. It was typical insecure-but-talented BS with him, as I told him I was honestly blown away by the soul and emotion in these sessions and he shrugged it off as 'crap'. He even does mostly covers, the times he does his own songs they're crunched into two different drawn-out medleys. "The setup was pure for me, I love the single-take off-the-cuff type recordings, it has a vibe and spontaneity that is so lacking in most modern music. Using his two Neumann U47's (one on his guitar, one for the vocals) and a U87 on the cello (some hippy-looking dude who was the first chair cello player for the Eugene Symphony, Dale Bradley), we laid down all the tracks straight. Dale didn't even know the songs, he just followed along in key, and quite the pro he was. "The 'gift' was essentially complete when the previous owner got what he wanted, the straight tracks with a quick mix to DAT. But it wasn't really done. So we added some production tracks to some of the songs, then spent three solid days in mixing the bad boy, and passed it along to Mickey. The response was rather tepid, and the last time I saw or even spoke to him he came by the studio a couple of months later to get his microphones. He made some remark about how his vocals sucked that day. Sure there're mishaps and a few humorous cracks, but I like the unrehearsed and raw atmosphere of it. "Making DAT back-ups in those days was a luxury, so I archived it to Hi-Fi VHS, a practice I had been doing for nearly five years at the time. The head spins at a high-rate of speed, so quality was excellent and kept it in the analog realm. Unfortunately, we now know that the shelf life isn't good for those things, and the occasional video "fart" looms over the ever ageing tape. "I came across the tape while cleaning out my studio a couple of months ago and decided the time was now or never for this thing. Of course, within a day of getting these tracks into my DAW, the VHS Hi-Fi machine I'd been using since 1986 for these archives just died outright. The tape is even stuck in the machine! It'll require some major surgery to get it out safely and changing machines is not even an option for tapes like this. So what I got is what I got. "And here it is, a few years after his death, some totally hidden sessions from the man who wrote a whole bunch of the old country and R&B hits. His songs were recorded by the likes of Ray Charles, BB King, Bobby Blue Bland, Jerry Lee Lewis, Kenny Rogers, Willie Nelson and Joan Baez, among others. He is perhaps best known for his composition, American Trilogy, recorded by dozens of artists, including a very popular Elvis Presley version. "It's not the cleanest of sources, but it's what I got. I think there's a DAT of this out there somewhere, and if it still exists I know who has it, but I'm not going there, no way in hell." "Triad was a new studio in town, and he [Mickey] was really trying to help Allan and Peter get started. Most of that studio wound up in our barn for 10 years, after Allan moved back East. Mickey conned Vic Clay into coming out and 'taking the board back home'. Poor Vic flew all the way out to Springfield, and after we got the cobwebs and mouse droppings off the top, Vic wisely decided that there was nothing worth shipping home. Two years ago, two friends of Steve's who have nothing better to do, took the board out of the barn, spent months and months cleaning off the contacts, and now have it up and running in a garage in Springfield. Maybe a hit will come out of it yet." On September 29, 2002 Mickey Newbury succumbed to a long-time lung disease and passed away in his sleep at home in Springfield, Oregon. He was 62. 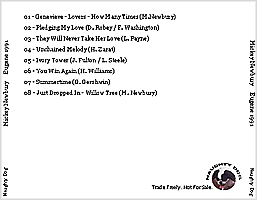 Click on the highlighted tracks to download the MP3s (these are high quality, stereo MP3s - sample rate of 192 kibit/s). 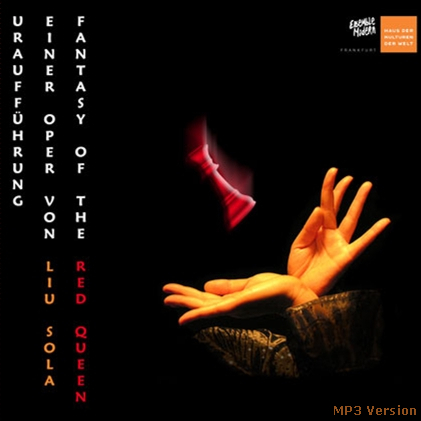 As far as we can ascertain, this recording has never been officially released. Note: Due to the size of some of the files, please be patient when downloading the tracks. Kindly email us at mybigo@bigozine.com if you encounter problems downloading the files. Click here to order Mickey Newbury albums.